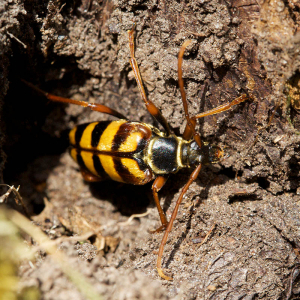 Observation - Hornet Beetle - UK and Ireland. Description: An uncommon Longhorn which is very localised in the UK. I saw this one fly past me during a walk in the New Forest. Fortunately it landed allowing me to get a few shots of it. The larvae develop in decaying tree stumps. An uncommon Longhorn which is very localised in the UK. I saw this one fly past me during a walk in the New Forest. Fortunately it landed allowing me to get a few shots of it. The larvae develop in decaying tree stumps.